Quark Expeditions is joining Adventure Canada as joint charterer of Fleetpro’s Ocean Endeavour. While starting in 2015 Adventure Canada will employ her in northern waters by summer, Quark will take her for the Antarctica high season starting in 2015-16. Meanwhile, Norwegian Cruise Line’s latest “all-inclusive” trial has left people to draw different conclusions. And the number of ships now being built with 4,000 berths is rapidly leaving behind the previous 3,600-berth ship as the standard for mass market cruising. 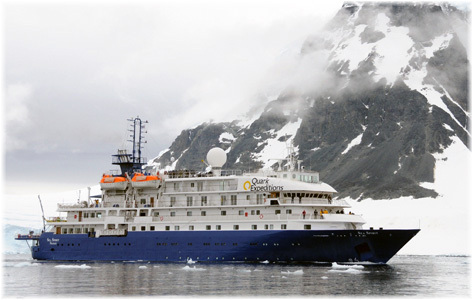 Quark Expeditions has announced the addition of a third expedition ship to its Antarctic fleet. Beginning with the 2015-16 Antarctic season, the 199-passenger 12,907-ton Ocean Endeavour will replace the 4,200-ton Sea Spirit. 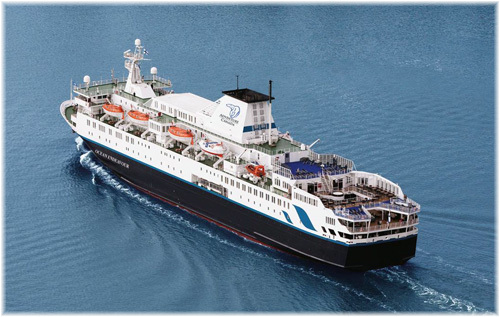 Quark offers several choices of vessels and voyages to Antarctica, all of which are managed by and chartered from Fleetpro Ocean of Miami, the former International Shipping Partners. 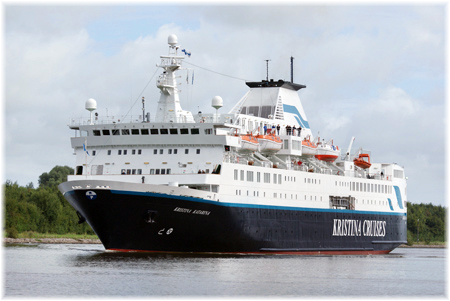 Built in 1982, the ice-strengthened Marshall Islands-registered Ocean Endeavour was converted for cruising in 2010, trading as the new-defunct Kristina Cruises’ Kristina Katarina, and underwent further extensive renovations this year. Passengers enjoy spectacular views on several decks equipped with comfortable lounge chairs and can take advantage of amenities including sauna, Jacuzzi, gym and spa. Following a million-dollar makeover, beginning in November 2015, Ocean Endeavour will offer a program of twelve voyages to Antarctica, the Falkland Islands and South Georgia. With an Ice Class 1B hull, she is engineered to explore the Polar Regions, Zodiacs for landings and generous deck space. The ship’s interiors have a contemporary appeal that provides a bright and spacious feel to the cabins and common areas. Ocean Endeavour will be the only polar adventure ship to focus on health and wellness. Passengers electing to participate can take part in yoga and stretch classes, enjoy healthy meals, a fresh juice bar, indulge in massage therapy or take advantage of the sauna or gym, in addition to experiencing the usual daily expedition activities. As an early booking incentive, travellers reserving by November 15, 2014, will save up to 25% off premium cabins and up to 15% off non-premium cabins on select voyages. Those who book any voyage on Ocean Endeavour before November 15 will receive a free transfer package, with a value of $800. Conditions apply. Back in April, Adventure Canada, which like Quark is based in Toronto, announced that it would be chartering the Ocean Endeavour between June and September 2015 for next year’s Arctic expedition season. 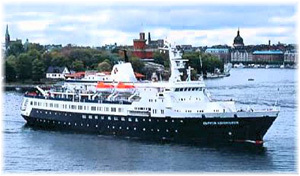 In its case, the Ocean Endeavour will replace the 4,376-ton Sea Adventurer, which has had to cancel two Adventure Canada cruises this summer because of engine problems. Outfitted with twenty Zodiacs, advanced navigation equipment and a ship-top observation room, Ocean Endeavour will be used to cruise remote northern environments around Newfoundland and Labrador, the Canadian Arctic, Greenland and the Northwest Passage, and for the first time in 2015, the Gulf of St Lawrence. The Marshall islands-registered Ocean Endeavour is owned by Achieva SF-One Ltd, which is affiliated with the Odessa Shipping Co Ltd of Odessa, whose fleet also appears to include the 12,798-ton Ocean Atlantic, also managed by Fleetpro and presently in use as an accommodation ship in the North Sea. Ocean Endeavour has been engaged in similar work this year from Lerwick. Sea Spirit and Sea Adventurer are also under Fleetpro management. Norwegian Cruise Line is asking passengers to make the most out of their next voyage with its new All-Inclusive Add-On Package. Claiming an added value of $1,200 per person, it is asking clients to “Cruise Like a Norwegian” and find out how the little extras add up. For an additional $899 per guest on select 7-night sailings, Norwegian will throw in prepaid gratuities, an ultimate beverage package and more. Its Freestyle cruising program adds multiple options in dining, onboard entertainment, and miscellaneous other items. That’s $1,798 per couple and might make sense if your usual on board spend is this high for a couple. There are significant savings there but the client has to turn into a real “consumer” to be able to take full advantage of them. Each will have to sit down and work out whether this package is worth its cost of $128 per person per day, especially when a drinks package is priced at less than half that amount. The people best able to take advantage of this program are probably the suite-bookers, where a 10% fare reduction on a $7,500 per person suite fare would return most of the cost of the package in one fell swoop. Cash-wise of course, Norwegian collects all that money at final payment date and won’t have to wait until it’s billed on board at the end of the cruise. It is also more than likely that, on average, the people who take up this package will be committing to a larger spend that they might actually have incurred. 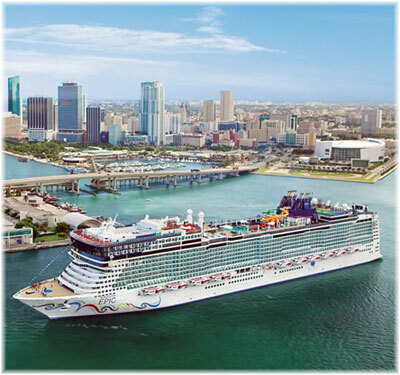 The recent additional orders by MSC Cruises and Norwegian Cruise Line, brining the number of ships with 4,000+ berths to seventeen, have confirmed this size as the latest standard for new premium cruise ships, superseding the 3,600-berth class ships of the previous Independence of the Seas, Royal Princess, Carnival Breeze and similar Costa classes. Norwegian’s Breakaway Plus Class are slightly wider and will contain an extra deck over the Norwegian Breakaway and Getaway. The Norwegian Escape is due to be delivered in 2015 and Norwegian Bliss in 2017 while the next two, just ordered, are for delivery in 2018 and 2019. 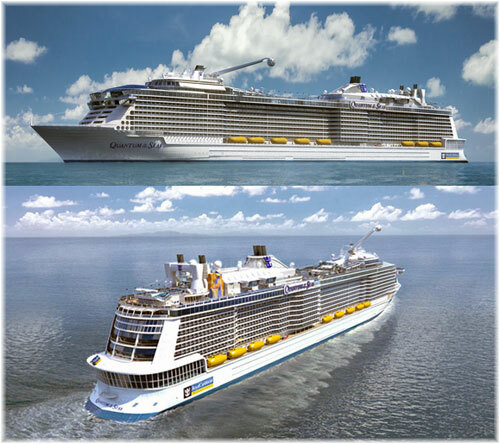 Royal Caribbean International are to take delivery of the Quantum of the Seas this autumn and UK-based Anthem of the Seas in 2015 while a third ship of the class has been scheduled for delivery in 2016. Other orders for Royal Caribbean at the moment are two ships of the larger 5,400-berth Oasis class. MSC Cruises’ new ships on the other hand include a shorter but wider French-built class with an interior promenade from STX France and a redesigned Italian-built engines-amidships design with more emphasis on the outer decks from Fincantieri. Two ships have been ordered, one of each class, for delivery in 2017 while 2018 will see delivery of an Italian-built unit and 2019 a French-built one. Options have so far also been placed for two more French-built units of the STX class and one Italian-built ship. The Carnival Vista is for delivery in 2016 and will be to a new design for Carnival Cruise Lines that will be their largest ship yet, but still smaller than Cunard Line’s Queen Mary 2. The Upper Premium market has meanwhile capped out at 2,850 berths for Celebrity Cruises’ Solstice class ships and 2,660 berths for Holland America Line’s new Pinnacle class ships, the first of which is set for delivery in late 2015. It is said, however, that Holland America may be having trouble in describing its new ship, which will have more than a quarter more berths than its 2,104-berth Nieuw Amsterdam. After all, at 2,660 berths, Holland America will no longer be able to describe its flagship as “one of our mid-sized cruise ships,” as it is so fond of saying, as this is forty more berths than offered by the Queen Mary 2.